When you’re looking to create a successful influencer marketing campaign — on its own, or within a wider digital marketing mix — measurement is a key aspect of your strategy. Metrics give you the information you need to understand the impact of your current campaign, determine ROI, and fine-tune your future projects. The challenge with influencer marketing metrics is that as the landscape shifts, so do the numbers that are actually worth tracking. The days of counting passive marketing-message recipients have been replaced by more dynamic methods of examining influence and information sharing. At Sway Group, we gather many different types of data for our clients and keep the latest trends and findings in mind as we analyze the results. We believe the overall number of engagements is one of the most critical metrics when it comes to determining the success of a campaign. As opposed to an impression, which is an estimate of the number of people exposed to a particular advertisement, engagement is a specific action a consumer takes with a given piece of content. Likes, views, comments, tweets, hashtags, repins, shares: these metrics help demystify campaign reach, but more importantly, they reveal levels of audience involvement. Engagements give brands the opportunity to listen, share, and build lasting relationships with customers. At Sway, these metrics are carefully tracked and analyzed across each campaign and platform, in order to provide valuable performance insight, as well as continually improve our ability to create rewarding partnerships between brands and influencers. CTR (click-through rate) is a standard industry method of determining how many people clicked a link included in an advertisement. Sway influencers include a tracking pixel within their posts, which allows us to see exactly how many total and unique visitors viewed the branded content. Customized bit.ly links allow for deep-dive analytics that help you understand the who, what, where, and when of the traffic within your campaign. Sway influencers are also able to include trackable retargeting pixels for agencies and brands who want to compliment promotional posts with same-campaign advertising, as blog readers surf other websites. When Instagram introduced its timeline algorithm, some accounts with large amounts of followers began reporting decreases in engagement as the image-sharing platform changed the order in which posts appeared in user news feeds. Instagram’s advertising tools, which are the same as Facebook’s, now allow businesses to run campaigns directly within Instagram. Whether or not account views are affected by Instagram’s prioritized in-house advertising, the bottom line is that audiences respond much more favorably to authentic content from a trusted source. While the right kind of influencer content has a better chance of resonating with Instagram followers than a traditional advertisement, numbers still matter. As it stands now, engagement rates remain a relevant metric on the platform, with a big-picture approach to account for the varying ways in which content is displayed. For instance, lower engagement rates are expected on accounts with 100K+ followers compared to those under 50K, so we frequently look at the campaign’s average engagement rate to accurately analyze performance on the platform. When determining Facebook performance for a given campaign, we analyze the number and type of engagements along with the content itself. When an influencer-created recipe demonstration video drives views, that’s an important measure of success — but we’re also looking at the number of likes and shares over time, as the brand messaging continues to organically gain traction among larger audiences. For some campaigns, sparking conversation is the main goal. Comments and tags offer great insight into how audiences are responding to sponsored content and provide brands the invaluable opportunity to be part of the discussion. As Pinterest continues to evolve and build their advertising functionality, the metrics available to users also shift. In the last few months, Pinterest has stopped providing the follower counts of all re-pinners, which was an important data point for calculating potential campaign impressions across the platform. However, they’ve also started to roll out the ability to see how many boards a pin has been saved to. While not yet available to all users, this metric provides useful new insight into the popularity of a given piece of content. Pinterest users have multiple ways of engaging with Pins: impressions, repins, clicks, and likes. Boosting performance on this platform means choosing influencers who are highly skilled in pinnable content creation — because an impression, in this case, does not always leave an impression. Keep in mind, too, that Pinterest content is evergreen: every piece of content has a much longer lifespan, and performance may change over time. 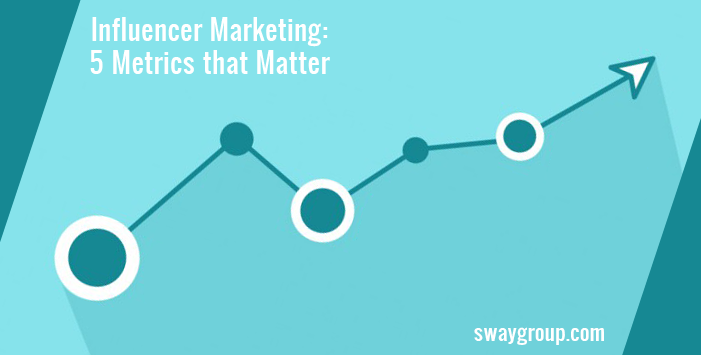 Like everything else in digital marketing, influencer measurement is evolving at a rapid pace. At Sway Group, it’s our job to be experts in this field, so we can help you truly understand a campaign’s effect on your business. We know the power of social influencers, and whether you’re looking for buzz, website views, referrals, purchases, outreach, or all of the above: we know how to deliver.